Golf is one of those sports that rarely gets a genre crossover. For every Ninja Golf or Ribbit King, there's a dozen Mutant League Football, Super Baseball 2020, or *gulp* Bill Laimbeer's Combat Basketball spinoff titles. 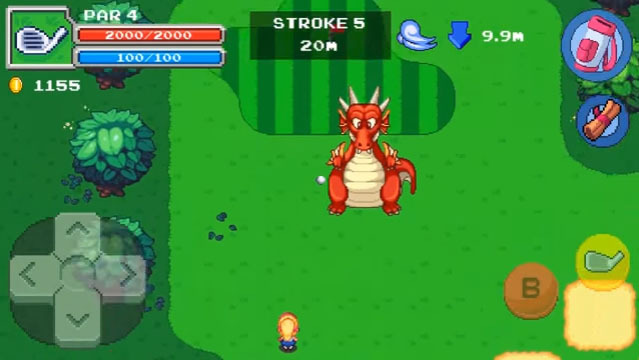 What's more, RPGolf, from developer ArticNet, is not a simulator but rather a fantasy action-RPG with swordplay, treasure chests... and actual golf. The game takes place over 18 holes as you knock your ball onto the green, into the bunker, and into water hazards while also contending with enemies wandering around the playfield. Players may select between a warrior, wizard, or rogue, each with different abilities and equipment, and players may level up by defeating enemies, which results in stronger attacks and a longer drive. Players can also stop off at the clubhouse, work on their skills on a practice range, buy new equipment, and craft better clubs to better their game. The game will be released on PC, Mac, iOS, and Android, but does not yet have an announced release date.